In case you didn't know there are thousands of educators and an array of learning communities over at Google+. The bottom line is that many people are missing out on some great content, resources, and conversation. From my point of view educators become quickly attached to one specific social media tool as their go to source for his/her Personal Learning Network (PLN). Take Twitter for example. Now anyone who knows me knows that I absolutely love Twitter as a professional learning and networking tool. It has been and will continue to be my number one choice when it comes to learning in the foreseeable future. Twitter has many positive attributes, but also a growing number of negative aspects. Some examples in my opinion, include an increasing amount of negativity and disrespect, rise in social media cliques, difficulty in following chats, noise, and overbearing opinions. Even as Twitter still works great for me and others it is not the only player out there. Nor should it be considered the best learning option for all. At times I just need to get away from the echo chamber to focus more on my learning. Circles - Unlike Twitter you can place all of the members of your PLN in different circles. With Twitter you send out a tweet and everyone who follows you, pulls up your page, or accesses the hash tag (if you use one) has an opportunity to see it. You can do the same thing on Google+, but you also have the ability to send your message to a specific circle, all of your circles, extended circles, or the entire Google+ world. With circles you can organize your PLN sort of the same way you would your websites using a social bookmarking tool. No Character Limits - Twitter is a bit prohibitive with it's 140 character limit. This is the one feature I love the most about Twitter as it allows me and others to be brief. What if you want more? With Google+ there are no character limits so you can be as detailed as you want. This really adds to your ability to make a point, explain a strategy, discuss an issue, etc. It also keeps all those random rants from entering into your stream that Twitter is becoming notorious for. Threaded Conversations - Twitter chats work for some, but they definitely do not work for all. Just the shear pace of a chat makes them difficult for many educators to follow. Personally I have found that when I try to engage and ask questions directed to specific people those questions go unanswered. With Google+ each update becomes a threaded conversation that you can engage in at your own pace. Comments also live in the update so you can go back and reference them at anytime. You can even share the thread across other social networks while accessing all of the resources, ideas, and knowledge that was discussed. I see this characteristic as bringing order to chaos. Dynamic Updates - In addition to sharing text, links, videos, and photos with Google+ you can also create and share events and polls right from your status update box. A More Comprehensive Profile - Your Google+ account seamlessly links your YouTube account. If you use Picasa all of the pictures you upload will also go to your Google+ page. Another cool picture feature is that all pictures include in my Google Blogger posts are archived in the photo section of Google+. The about section allows you to include much more detail than Twitter without character limits and and array of additional categories. Hangouts - Many educators are aware of Google Hangouts (GHO's) that allow users to engage in free group video chat. Hangouts on Air are even more dynamic video chats where you can schedule live broadcasts, host interactive conversations by taking audience questions in real time or in advance, use live apps to enhance the viewing experience, and immediately archive to YouTube when finished. Communities - This is one of my favorite features of Google+. Anyone can join an existing community or create a new one. The difference between Twitter is that you can have rich conversations and share blog posts, resources, ideas/strategies, plan/publicize events, and have discussions aligned to specific categories. Evan Scherr and I have created a Digital Leadership Community. With the evolution of #digilead on Twitter our goal was to develop a space that brings together all the people, ideas, resources, and conversation related to digital leadership and learning. Evan and I hope that you will consider joining this community and sharing everything that you already do on Twitter. Not only is it free, but it gives you a chance to amplify your work and voice while engaging with like-minded educators at a deeper level. Google+ is a powerful and dynamic social media tool that many educators and leaders are not taking advantage of. To begin simply start by setting up your circles, connect with other educators, share your content (i.e. blog posts) and lurk for a little bit. Search for and join a few communities as well. If you need any help please feel free to connect and engage with me on Google+. So what is stopping you from using Google+? If you are using it consistently what added benefits would you highlight? So the other day I tweeted out this comment, “I am amazed each day to see so much educational progress in my Twitter feed. This should be the norm, not the exception.” Many people in education talk a great game when it comes to the effective use of technology, but the results (lack there of) speak for themselves. I constantly see and hear about leaders who tout themselves in a way that makes others develop a perception that they actually know something about the effective integration of a variety of technology tools to improve professional practice. However, once you get past the rhetoric you quickly realize that it is just talk with a clear lack of substance. This is not to say that they are unwilling to learn or embrace significant change in this area. It just hasn’t happened yet, at least from my view. Thus, the use of social media in schools by educators continues to be an uphill battle. For those educators and schools that are either resistant to or unsure about using social media, I challenge you to move from a fixed to a growth mindset to create schools that work better for kids and establish relevance as a leader in your district, school, or classroom. Begin to strategically utilize an array of free social media tools such as Twitter and Facebook to communicate important information (student honors, staff accomplishments, meetings, emergency information) to stakeholders in real-time. Consistency aligned with intent is key. Take control of you public relations by becoming the storyteller-in-chief to produce a constant stream of positive news. If you don't share your story someone else will and you then run the chance that it will not be positive. Stop reacting to public relations situations you have limited control of and begin to be more proactive. When supplying a constant stream of positive news you will help to mitigate any negative stories that might arise. Establishing a brand presence should no longer be restricted to the business world when schools and districts now have the tools at their fingertips to do this in a cost-effective manner. Simply communicating and telling your story with social media tools can accomplish this. When you do, the brand presence develops solely based on the admirable work that is taking place in your district, school, or classroom. Connect with experts, peers, and practitioners across the globe to grow professionally through knowledge acquisition, resource sharing, engaged discussion, and to receive feedback. This will not only save you time and money, but will open up your eyes to infinite possibilities to truly become a digital leader. Who would not want to tap into countless opportunities that arise through conversations and transparency in online spaces? Don't wait another second to start building a Personal Learning Network (PLN). If you are an administrator, stop supporting or enforcing a gatekeeper approach and allow educators to use free social media tools to engage learners, unleash their creativity, and enhance learning. Hiding behind CIPA is just an excuse for not wanting to give up control. If you want students that are real world or future ready, they must be allowed to use the tools that are prevalent now in this world. Schools are missing a golden opportunity and failing students by not teaching digital responsibility/citizenship through the effective use of social media. We need to begin to empower students to take more ownership of their learning by promoting Bring Your Own Device (BYOD) and the use of mobile learning devices if schools do not have the means to go 1:1. By BYOD I don’t mean just allowing kids to bring in and use their own devices in the hallways and during lunch. That is not BYOD. Real BYOD initiatives allow students to enhance/support their learning experience, increase productivity, conduct better research, and become more digitally literate. It is time for the profession of education to catch up to society. In order to start moving schools in a better direction we must help leaders experience the true value of technology. Once this happens they can begin to better model expectations for others, which will result in sustainable changes leading to transformation. Our students deserve and demand better. Together we can continue to be the change that we want to see in education. In September 2014 I was honored to have been asked to speak at TEDxBurnsvilleED. The theme for all of the TEDx talks was Real World Ready. When looking at the structure and function of the majority of schools across the globe it was quite evident to me that students are being prepared for a world that no longer exists. Compounding that issue is the fact that school traditionally works better for the adults than the kids who are there to get an education. When there is more of a focus on conformity, control, rules, test scores, maintaining the status quo, and rigid schedules kids lose. School and life should no longer be separate entities. As educators, we need to begin to implement a bold vision for change to flip the concept of education and focus on relevant learning experiences that actually prepare students for the real world. School should allow students to follow their passions, use real-world tools to solve real-world problems, develop and apply essential skill sets, think divergently, create artifacts of learning to demonstrate conceptual mastery and foster creativity. Schools need to work for students if the goal is to prepare them for the real world. Below is my brief TEDx talk on the topic. I would love to hear your thoughts. Do you think I am on the right track? What else do schools need to do to prepare students for success in the real world? Throughout my life I have either attended, or worked in, a public school, as had my parents. In terms of my own education, I always felt that I was provided with the knowledge and skills to succeed in life. By no means was my pubic schooling perfect and when I look back there were many instances that presented opportunities for improvement. The bottom line, however, was that I had passionate and caring educators who pushed me to be the best student that I could be regardless of the deficiencies inherent in an industrialized model of education. As fate would have it my role changed and I began to have a direct impact in the position of either a teacher or administrator. Throughout my ongoing career as an educator in public schools, I have always worked to provide a relevant, meaningful, and applicable learning experience for my students. I have written extensively about many of the successful initiatives that were implemented over the course of my career at New Milford High School. Even with these successes, many of which have been widely publicized, we were never perfect when it came to meeting the needs of all learners. This was also the case when I recollect my days as a science teacher and coach at Watchung Hills Regional High School. Mistakes were constantly made and some persistent issues were never changed no matter how hard we tried. Through it all there was more positive than negative in each experience and this has only strengthened by resolve for, and support of, public schools. When it came time to make a decision about where to send our two young children to school there really was no decision to be made. Even though I was intimidated by the outright size of the New York City School system I was fully committed to sending my children to public school in my home borough of Staten Island. We were fortunate to move from our first home on the island to an area called Pleasant Plains and were ecstatic to find out that we were zoned for Public School 3. The word on the street was that this was a very good school, but it wasn’t until I met Principal Judy Wilson that I realized how special the school really was. I still remember the day when I sent my son Nick in with a copy of the Scholastic Administrator magazine where I was featured on the cover. Once Judy realized that I was Nick’s father we began to immediately have conversations on how to improve the school culture at PS 3. Judy Wilson is such a passionate principal who works tirelessly to create a school that fosters a love for learning. At times the cards are stacked against her because of the levels of bureaucracy, mandates, and senseless policies that are embedded elements of the NYCDOE. In the face of these challenges and many others, she has worked collaboratively with passionate staff members to provide authentic learning experiences for the students there. For example, a dance studio was created in an unused space and dance has now become integrated across the curriculum. The dancing classroom program was brought to PS 3 five years ago for every 5th grade student. The program builds social awareness, confidence and self-esteem in students through the practice of social dance. They cultivate a new competition team every year composed of 12 students who compete citywide. Every year the team has brought home gold medals. Last year Judy brought VR Quest to the school where students, including my son, were able to create their own 3D virtual reality games from scratch after school. Thanks to the incredible guidance of Media Specialist James Laieta, my son was part of his S.W.A.T. Team where students worked collaboratively after school to work on their games. James volunteered to do this, as he is a true educator who believes in allowing students to follow their creative passions. Another highlight at PS 3 includes an annual field trip on board a floating lab. Then there are more personal situations that mean more than words can describe. When Judy Wilson found out that my son was becoming disinterested in school she went out of her way to have him do the morning announcements with older students. This not only made him a bit more eager to go to school, but also has had a positive impact on his communication skills. These are just a few examples of how the school is working to better meet the diverse needs of my children. All in all I am happy with my children’s school, but just like in my experiences, there have been a few issues that have clouded my judgment as of late. These issues relate to homework and Common Core implementation. Without going into much detail these isolated issues have morphed into a message that my kids hate school. I even went as far to state this emphatically in my recent TEDx talk. The honest truth is that my kids are, well, kids and as such they typically don’t like some aspects of their formal education. I know I didn’t. In retrospect, going forward I need to focus more on collaborating with the staff at PS 3 to improve some of the elements that my children don’t like instead of rattling off sound bites. Today I sat down with my kids and had a detailed conversation with them about all the many elements of PS 3 that they love. Let me tell you, there were many! Judy possesses an undeniable focus to move the school forward and actually implement ideas and suggestions I put forth. I should not use my influence to paint an inaccurate picture of a school version of David going up against Goliath, which is the NYCDOE. As the motto states, PS 3 is “The Place to Be.” I am a firm believer in this and now have to act like it. Instead of focusing on the negatives, which are inherent in any school system, I will work to promote what makes PS3 special while providing constructive feedback and hands-on support as needed. Back in 2009 when we began to transform teaching and learning at New Milford High School we were extremely fortunate at the time to have wireless Internet access throughout the school. This was an extremely big deal five years ago and ultimately gave us an edge in terms of the many successful initiatives we rolled out including Bring Your Own Device (BYOD) and digital learning across the curriculum. The ubiquitous access to the Internet eventual led to the implementation of more student-centered instructional practices where students began to take ownership over their learning. We began to create a school that worked better for them in that they could create learning artifacts to demonstrate conceptual mastery through the construction of new knowledge and application of skills. Access to the Internet allowed us and our students to harness and leverage thousands of free tools to support teaching and learning as described above. Fast forward to 2014 and one would think that all schools would be in a position to provide Internet access to students like we were able to for the past five years. Obviously I was extremely naive to think this. The typical K–12 public school has the same internet access as the average home, only with 200 times more users. 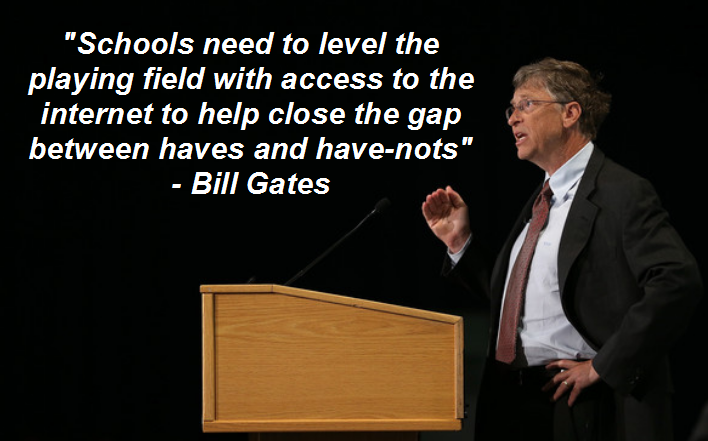 That means that 2 out of every 3 students do not have the high speed internet access they need in their schools. The Federal Communications Commission (FCC) is considering expanding Internet access in schools and we need your help telling them to vote “YES” to expanding E-rate in order to provide the nation’s students with the tools they need. Once your video is created share across social media channels such as Twitter, Facebook, Google+, and Instagram. I made the video above quickly using Instagram. I suggest you also tag some of your connected friends in your social media update to make this initiative go viral in a similar way to the Ice Bucket Challenge earlier this year. Bottom line - all students deserve quality Internet access in schools so that they can use real world tools to do real world work, develop digital literacy skills, collaborate with peers, unleash creativity, and find more relevance in their learning. When one looks at education in general there is very little change from over 150 years ago. Back then the education system was designed to serve an industrialized world that was in desperate need of skilled factory workers. What resulted was the quick development of a system to educate as many students as possible in a fashion that was cheap and easy. Conforming to this system created masses of compliant students who ultimately acquired the necessary skills to assist society become more industrialized. Fast forward 150 years and you will notice that the world has radically changed, but education has not. What are we really preparing our students for then? Seth Godin puts this question into context in the video below. Watching the video above is a painful reminder of my lack of leadership at one point. During the early years as a high school principal I worked terribly hard to sustain practices that had been ingrained into the school learning culture. These practices looked good when viewed on the outside as they sustained the status quo, maintained control, and ensured the enforcement of rules/policies with the end result being an efficient educational system. The resulting culture focused squarely on the metrics that my stakeholders held dear. So in the end my leadership was defined by maintaining a building driven by standardized test scores and how well students were able to conform to the system that I was brainwashed into sustaining. Luckily for me I was diverted along a different path thanks to an epiphany provided by social media. Upon reflection many years later, I have realized that my efforts created a stagnant school culture that was not appreciated in the least bit by the most important stakeholder group I was responsible for – my students. If that was not bad enough, I also kept other stakeholders in the dark in regards to the innovative work that was taking place each and every day in my school as I relied on traditional methods of communication. The evolution of technology has and continues to invoke fear in the eyes and minds of many types of school leaders tasked with transforming school cultures. 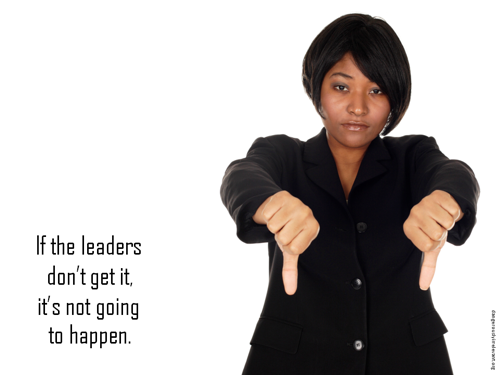 The fears, perceptions, and misconceptions that drive many leaders to maintain the status quo only work to perpetuate a growing disconnect that students experience with learning today. Conversely so other stakeholders remain in the dark in a time when leaders must be proactive with public relations to combat the negative rhetoric prevalent across the globe when it comes to education. Why today’s school leaders must become digital leaders: Leadership is no different today than it was years ago. The only difference is that style and focus need to change with the times if we are to accomplish the lofty task of preparing students for a dynamic world that is more social and connected as a result of technology. The seven pillars of effective digital leadership: Specific areas embedded in the culture of all schools that can be improved or enhanced through the use of available technology, especially social media. They present a framework from which any educator or leader can begin to harness the power of technology to change professional practice and initiate sustainable change. It is up to leaders in all positions to work smarter, not harder, if we are to create schools that provide an education that means something to our learners. For this to happen though, leaders need to get their heads out of the sand, acknowledge that the system and outdated practices no longer suffice, and take action to improve school culture. If not, yet another generation of students will be lost upon graduation.